Hala Khouri describes how eating is so often connected to shame in U.S. culture and offers signposts for listeners to more kindly relate to our bodies. In her work, Khouri normalizes people’s struggles with body issues and helps us connect with ourselves and with one another. She discusses the difference between being fit and being healthy. As she shares her own journey through disordered eating, an addiction to sugar, and negative body image, she also shares the profound insights yoga has offered her. Hala Khouri, M.A., E-RYT, has been teaching yoga and the movement arts for over 20 years. She earned her B.A. in Psychology from Columbia University and her M.A. in Counseling Psychology from Pacifica Graduate Institute. She is trained in Somatic Experiencing, a body-based psychotherapy that addresses trauma and its symptoms. She is a co-founder of Off the Mat, Into the World a training organization that bridges yoga and activism within a social justice framework. 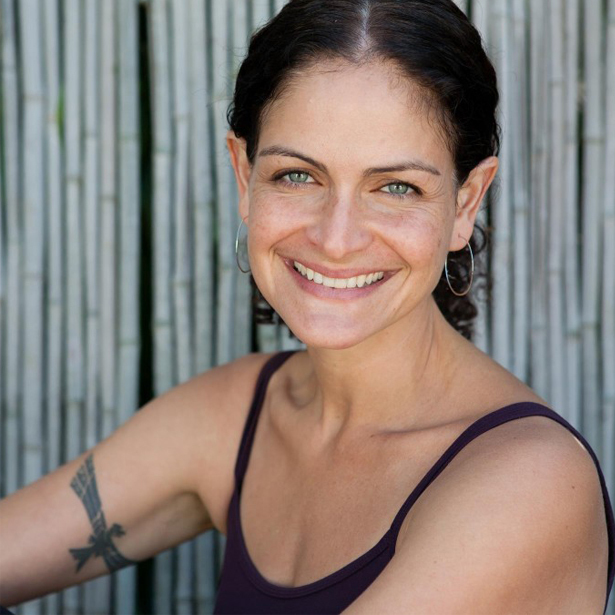 She leads trauma informed yoga trainings nationally and her own 200hr Yoga Teacher Training in Los Angeles. She lives in Venice, CA with her husband and two sons.